Boltless shelving assembles quickly and easily. Complete boltless connection, no bolts, screws or pins. No cross bracing is needed which provides access from all four sides of the unit. Available with with many shelf options; particleboard, melamine, wire mesh decking, metal shelves and fire retardant boards. Boltless connection means quick and easy assembly. No small parts to misplace. We like to think of it as hassle-free. 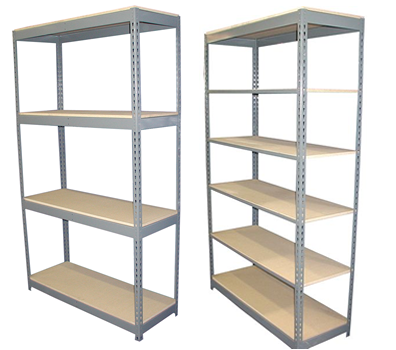 Shelf Master Carries a wide variety of sizes, from starter units to Add-Ons regardless of your shelving configuration, Shelf Master has your solution.